It is certainly a great accomplishment to walk this earth at 100-year-old, but it’s an even greater achievement to live well beyond it. 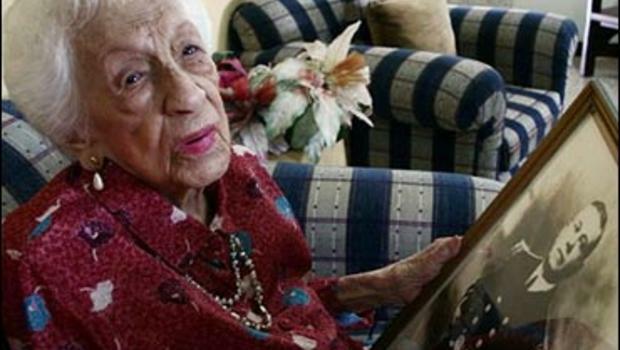 Believe it or not, there were super centenarians who lived above 120 years. People who surpassed life expectancy of human beings even though super centenarians are far rarer than centenarians. These people lived through world wars, the sinking of the Titanic, the space race, saw more social and technological change and endured more late-life congratulations and much more. But what’s even more exceptional is that when they were born, the life expectancy for people in the U.S. was just around 60. Read to see the list of seven oldest people, what killed some of them and what kept some of them alive. You have to walk in the ways of God. Don’t follow anyone else. Be obedient and follow the laws and don’t worry about anything. I’ve followed him for many, many years and I ain’t tired. She was a Japanese super centenarian who was the world’s oldest living person from 12 June 2013 until her own death on 1 April 2015. Okawa is the oldest known Japanese person ever, the oldest person ever born in Asia, and the fifth oldest verified person ever recorded. Okawa was the 30th person known to have reached age 115, the tenth verified person to reach the age of 116 and the fifth verified person to reach the age of 117. She had four grandchildren and six great-grandchildren and was able to walk until she was 110, when she began using a wheelchair to avoid falls. She died from heart failure at her nursing home residence in Higashisumiyoshi-ku, Osaka, Japan at 6:58 AM, on 1 April 2015 less than a month after her 117 birthday after According to her, delicious things including ramen noodles and beef stew, as well as hashed beef and rice mackerel sushi, daily cup of coffee and sleep were the reasons why she lived so long. She was born on August 29, 1880 and she died on April 16, 1998. She was a French Canadian supercentenarian who, became the oldest recognized living person upon the death of the world’s oldest person at that time. Meilleur is the oldest verified Canadian ever and the fourth oldest person in history. By the time she died of a blood clot at age 117 in April 1998 in Corbeil, Ontario, one of her sons was also living in the same nursing home, and her oldest living daughter, Gabrielle Vaughan, was 90 years old. Meilleur had 85 grandchildren, 80 great-grandchildren, 57 great-great-grandchildren and four great-great-great-grandchildren. She was said to be a vegetarian and a devoted cigarette smoker. She took up fencing at 85, still rode a bicycle at 100 and made a rap CD at 121. Many credited her longevity and health to her vegetarian diet including olive oil, port wine and chocolate. This American supecentenarian was born on July 16, 1875 and she died March 21, 1993 at the age of 117 years, 248 days. She is the oldest ever fully documented person born in the U.S. state of Alabama. She is the second-oldest person ever from the United States and the world’s third-oldest validated person ever. She had eight children in her 1901 marriage to John Hannah, but only two of her children survived her. Sarah was born September 24, 1880 and she died on December 30, 1999. She was an American supercentenarian and was called the world’s oldest living person by Guinness World Records from April 16, 1998, the date of the death of 117-year-old Canadian Marie-Louise Meilleur, until her own death. She is the current second-oldest validated person ever and was the last verified living person to have been born before 1885. She had great passion for nibbling on milk chocolate turtles, cashews, and potato chips. She had no known illness at her death except for being about deaf, and appears she died of out of natural causes. According to reports Sarah died peacefully in her sleep, sitting in her chair in her room. She had a daily dose of chocolate up until her death and was called a chocoholic. Surviving with her daughter, are a grandson, three great-granddaughters, five great-great-grandchildren and a great-great-greatgrandson. Her family credits her longevity to her calm demeanor and acceptance of life as it comes. Rarely, did she get angry said her family memebers. ‘She was a jovial, lovable person to be around,” said Bob Butz, 75, her grandson. ”She was a good sport.”Despite she saw 20th century developments ranging from the advent of the automobile to manned space travel, she stayed faithful to 19th century values of self-sufficiency and family loyalty. She was said to have been going to the hairdresser every Tuesday, and was her weekly custom. She loved wearing a fashionable dress and her trademark smile, she had her hair done in a French twist, the classic style she preferred for decades. Jeanne Louise Calment was born on 21 February 1875 – 4 August 1997. She was a French supercentenarian and she even outlived both her daughter and grandson by several decades. 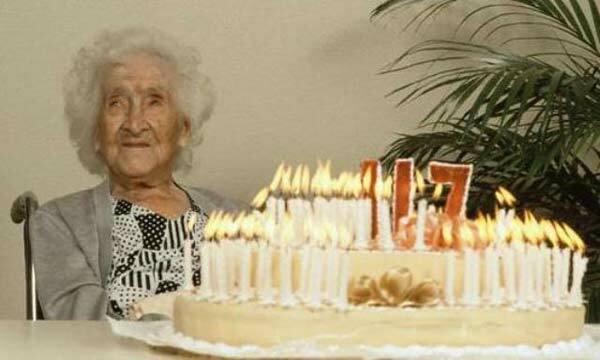 She is known to have had the longest confirmed human lifespan on record for living to the age of 122 years, 164 days. Calment became famous from the age of 113, when the centenary of Vincent van Gogh’s visit brought reporters to Arles. Calment credited her longevity and relatively youthful appearance for her age to diet rich in olive oil as well as a diet of port wine, and ate nearly one kilogram (2.2 lb) o chocolate every week. She also commended her calmness, saying, “That’s why they call me Calment”. She was reportedly mentally intact until her very end.